Wallabies head coach Michael Cheika says he won’t panic with his selections by making wholesale changes to his team for the second Test. Cheika says that he is relishing the chance to get back at England quickly as the teams meet again on Saturday in Melbourne. Australia were beaten 28-39 by England who earned their first ever victory in Brisbane on Saturday. A victory in Melbourne will seal the three Test series for England. Cheika said after the first Test that the Wallabies gave England easy ball and that the Wallabies were on the back foot as England got the 50-50 calls by the referee. England’s victory was their biggest ever victory on Australian soil over the Wallabies and it was also the most points scored by England against Australia at home or away. The most England had ever scored in a match on Australian soil was 25 points while at home in England the previous record was 35 points. Despite the record scores Cheika says he will keep the faith in his players and will largely stick with the starting XV. Cheika added that he is looking forward to Saturday as it gives them the chance to avenge the loss that had made him feel “sick”. 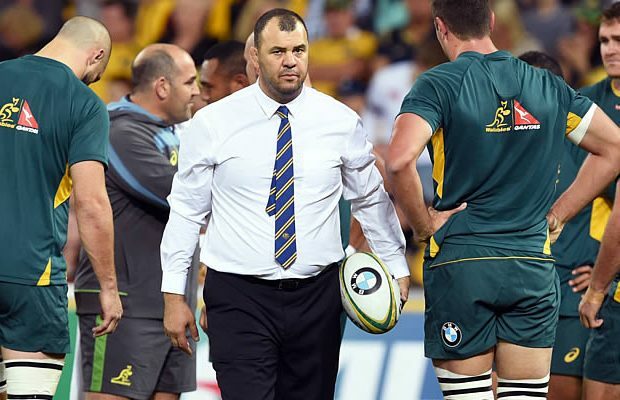 “Maybe the odd tweak here or there,” Cheika told Stuff on his selections for the second Test. “I’m not going to say I was happy because you feel sick when you lose, especially at a Test match in front of a great crowd like that at Suncorp. We’ve just got to make it go well for longer. Cheika said the Wallabies would concentrate on working on their ill-discipline and handing this week as these two facets contributed to the Wallabies loss. “We just probably left too many 50-50 moments out there, definitely too many soft penalties that’s for sure and that’s an example of a 50-50 moment,” Cheika said. “I thought our defence was quite good but when you give away that type of traction and field position and point-scoring opportunities that’s what happens. One or two things don’t go your way and you’re behind on the scoreboard. Australia were denied a try in the 28th minute for obstruction but Cheika disagreed with the referee and TMO and questioned why the try was not given. “It’s not obstruction. The guy went to the wrong guy. When the referee asks the TMO ‘is there any reason why I can’t award the try’? the TMO showed the pictures and just said: ‘That’s the angle’. The TMO didn’t want to give the decision … if it was try or no try, different story … but if he asks if there is ‘any reason I can’t award the try’, it has to be clear,” Cheika said.